In a 5 quart pot preheat olive oil over a medium high heat. Saute celery and onion until translucent about 4 minutes. Add 2 cups of mushrooms, garlic, and 1 tablespoon of Backyard Blend and continue to saute until all veggies are starting to brown about 5 minutes. Stir in flour and continue to saute for 1 to 2 minutes then deglaze with brandy. Add stock and allow your cream of mushroom base to come to a boil and reduce heat to medium. Stirring every 10 minutes or so allow the stock to reduce by half roughly 30 minutes. Remove from heat and allow to cool for 10 minutes. In a blender add soup base and run blender on low speed with the lid off slowly add cream. Now check the thickness of the cream of mushroom if it's not as thick as the can stuff add some more flour to the blender little by little and continue to run on low until consistency is thick enough. Salt and pepper the cream of mushroom to taste. In a separate casserole dish a place green beans, remaining mushrooms and cream of mushroom. One top place thinly sliced onions, panko breadcrumbs and some more Backyard Blend. Bake in oven on the top rack for 40 minutes or until breadcrumbs are browned. Serve. In a deep cake sheet or casserole dish add sweet potatoes cut into 2 inch thick rounds, beer, and TOSA seasoning. Cover with foil and bake for 60 minutes. Finish the dish with butter allowing the butter to mix in with reduced beer and serve. Spread bread out evenly over a large cookie sheet drizzle with olive oil and season with 1 tablespoon of Backyard Blend. Toast the bread into croutons on the top rack of your oven stirring every 10 minutes or so to make sure you don't burn the croutons. When browned and crunchy throughout set aside and allow to cool. In a large mixing bowl combine carrots, celery, garlic, onion, mushrooms and remaining seasoning. Stir all of the ingredients to get the seasoning and veggies all mixed together. Stir in croutons next being careful not to break up the croutons too much. 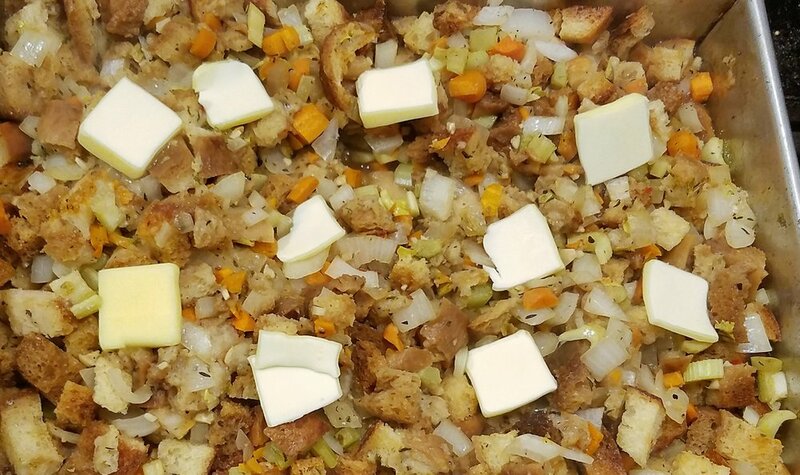 Pour stuffing mixture into a tall cake sheet, casserole dish or turkey cavity (if cooking in the bird skip adding stock and disregard suggested cooking time). Pour stock over stuffing making sure to wet most of the croutons. Cover with foil and bake for 70 minutes. After 70 minutes remove from the oven and remove foil and then add thin pads of butter evenly over the dish and return to top rack of oven for additional 20 minutes to brown the top and finish cooking off excess stock. Salt and pepper to taste and serve. Before returning to the oven to brown. Combine HOT water, sugar, and salt in your bucket or stock pot. Stir until ingredients are completely dissolved and allow it to cool completely. After cooled add 2 thin sliced lemons into the brine then you're ready for to dunk the turkey! To prep the turkey remove the neck and gizzards and set it aside for gravy. Rinse turkey thoroughly including the cavity, then place the turkey in the bucket of brine head side down. Cover with foil or plastic wrap and refrigerate overnight or at least 12 hours. Combine on ingredients in the bottom of your roasting pan! Let's Get that bird in the oven! Cooking time 15 minutes per pound flipping the bird after 40% of cooking time! Remove turkey from the brine and rinse thoroughly. 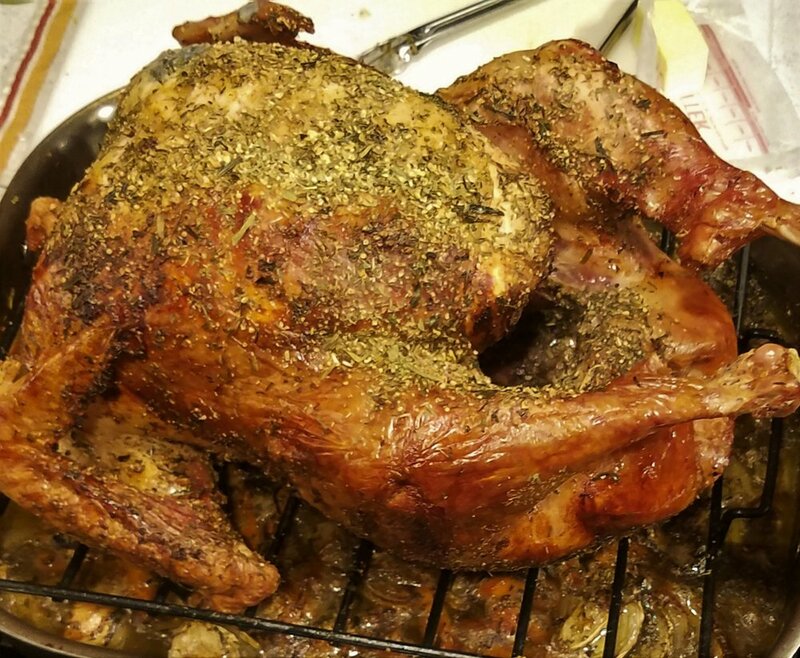 Place wet turkey on a roasting rack over the gravy base you just made (its okay if the veggies are touching the bird). Rub the bird inside and out with South of France allowing any access rub to fall into the gravy base, the moisture from rinsing the turkey should help the spices to stick no need for oil or butter here. Start with the turkey breast side down on the rack. Loosely cover turkey with foil and place in the oven on the second rack from the bottom (so that the base of the turkey pan in in the bottom third of the oven, this allows the wine in the gravy base to help cook the turkey evenly. It also should leave the top oven rack available for stuffing and green bean casserole.) Allow turkey to cook for 3 hours breast side down. After 3 hours flip the turkey to breast side up, throw another healthy pinch of South of France on it. If you would like to stuff the bird do so now! Recover with foil and return the turkey to the oven for additional 3-4 hours depending on the size of your turkey (10-13 pounds 3 hours 16-20 pounds 4 hours). Remove turkey after cooking time is up and use a meat thermometer in the thickest part of the breast to make sure turkey is at 165 F or higher before allowing it to rest. If the turkey isn't cooked enough or the skin isn't browned to your liking then put the bird back in the oven for 30 or so minutes uncovered. When the turkey is cooked enough remove turkey from the roasting pan and allow it to rest for 30 to 45 minutes for a juicy turkey. Now it's time for the gravy! After removing the turkey strain the juice from the turkey pan into a separate container and set the juice to the side. In a deep pan over medium low heat add butter and flour and whisk until the roux begins to bubble and flour and butter are well integrated. Stir in the turkey juice little by little until gravy gets to appropriate thickness (should thoroughly coat spoon) then reduce the heat to low and allow to stay warm until dinner is served. Salt and pepper to taste and serve! 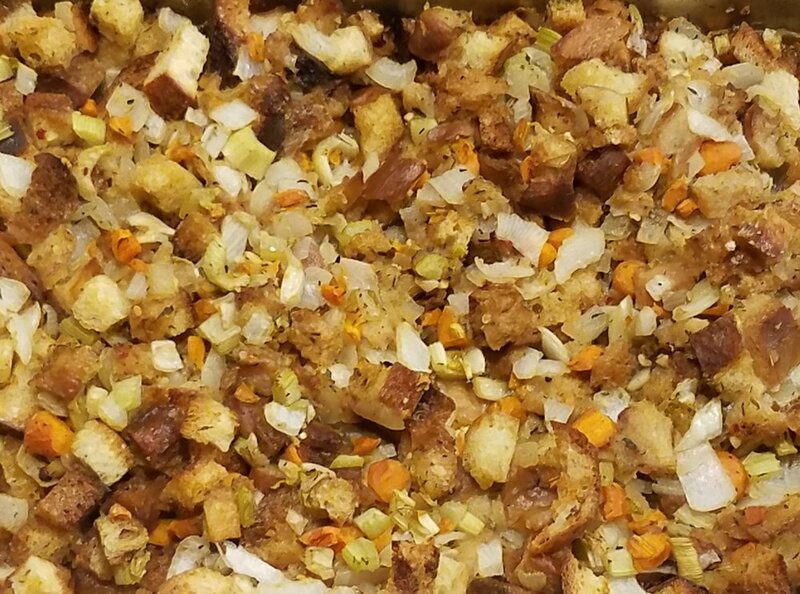 This is our absolute favorite Turkey and Gravy!